TET (Glamoureyez x The One and Only) Ev. EM Re. 6 1/4" flowers, 32" scapes, 4-5 way branching with 30 buds. 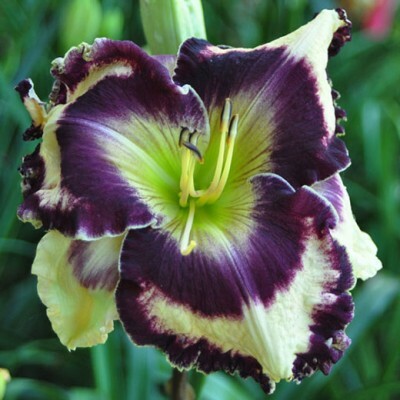 RIBBON OF DARKNESS has large flowers on stout scapes that have very large green thoats with deep purple eye and edges all on top of a light cream self. Heavy rebloomer. Fertile both ways.